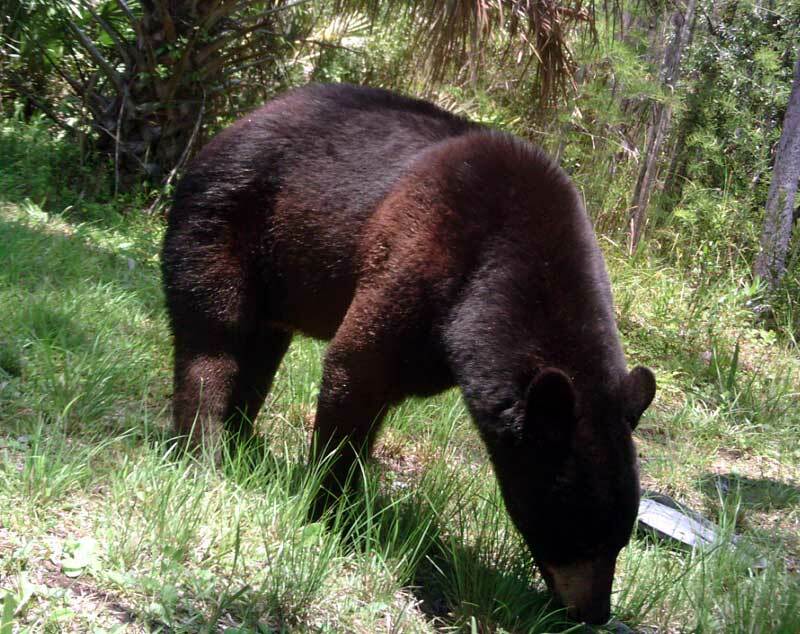 Over the years, there has always been Black Bears in the Big Cypress Swamp, Even in the early Six Pack days, there were bears visiting our camp. Once every two or three years a bear would come by, his presence being know by used bear food left in the yard for us to step in. Or worse, the bear managed to break into the kitchen, and destroy the food cabinet, leaving a mess all over the floor. I don't know what it is about bears, but they can never leave a building the same way they got in. We learned finally, what not to do in handling our food storage and we have not had a break in for about ten years now. The bears are still there, in fact with modern game cameras, we are able to record the visits and those now average about every two or three weeks. 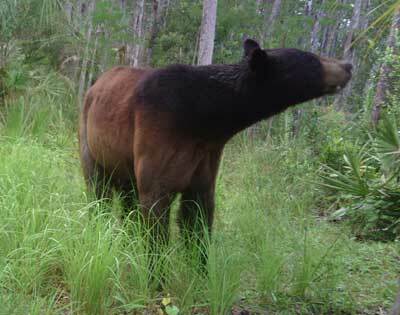 The bear population has grown over the years, which is opposite the trend for most other animals of the swamp. As you might imagine, food still is a motivator for the visits. Food is now provided by a feeder hanging about 50 yards from the buildings. Shared by all animals of the swamp, the feeder gets visits from Deer, Raccoons, Possums, Turkeys, Fox Squirrels, Grey Squirrels Dove, all kinds of song birds and BEARS. The feeder is set to throw a hand full of corn and birdseed, once a day. Hardly enough to satistify a hungry bear, but the smell of corn is enough to bring them around and try to help themselves to more. As you can see in the video to the right, the bears are pretty smart, mentally making the connection between the cable supporting the feeder and the feeder itself. The video on the left is a momma black bear and her three cubs. 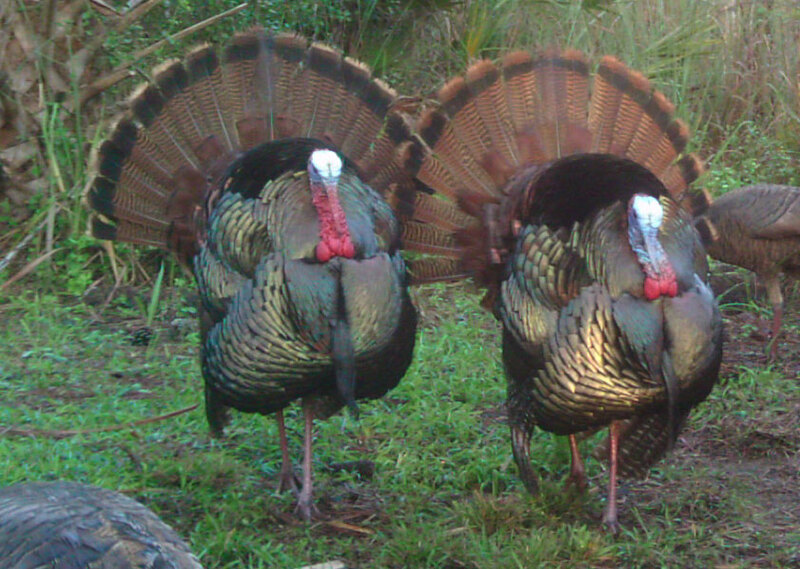 In November of 2013, I walked over to visit a nearby camp. Walking up a trail cut through palmettos and pine trees, as I neared the camp, I could hear noises coming from the yard outside the camp. I could not see what was making the noise, but I was convinced it was the camp owner. It sounded to me like someone was working with something metal. Metalic scratches and light banging is what I heard, so to let someone know I was approaching, I called out "Hello". Not getting an answer and thinking they may not have heard me, I kept walking up the trail, and through the palmettos, I could partcially see a head, with what I thought was a hat on. So, I called out again, "Hello" and still did not get an answer. Now I was almost to the camp yard and thinking I should not leave the impression I was sneaking in on someone, I stepped out in the edge of the camp yard, making myself completely visible. I found my self looking at a momma bear, eating corn out of a feeder set about standing head high for a bear, with three cubs milling around her feet, trying to beat the other cubs to any corn kernal that landed on the ground. Momma did not see me right away, giving me time to reach in my shirt pocket and pull out my video camera. It beeped when I turned it on, momma heard it, an looked my way. She got down on all fours and started walking away, as I got the camera on her. The video shows the rest. Most of the bear videos are at night. Bears tend to wander the swamp at night looking for food, avoiding the heat of the day. The video to the right is of the momma bear and the three cubs, visiting the feeder, earlry this year. You may notice that one of the bears, the last one in both videos is significantly smaller than the other two cubs, the runt of the litter. The cubs look to be in there second year with the momma bear and are soon to be sent off on their own. In fact pictures from the feeder last month shows one of the clubs (the one with a black patch on its back) visiting alone at the feeder and may well be on its own now.